Brandy Titus, left, Jenine DelPalazzo, middle, and Jeffrey Greenberg, right, were sworn in to the Berlin Borough Board of Education Thursday, Jan. 3. 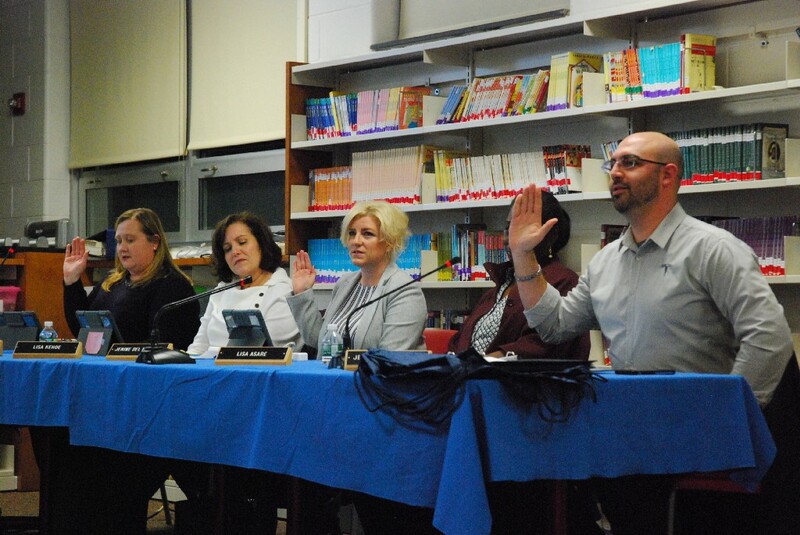 The Berlin Borough Board of Education reorganization meeting Jan. 3 came with late fireworks to celebrate the new year. The meeting started with the board reorganization at 5:30 p.m., and was followed by a workshop and then the regularly scheduled board meeting at 7 p.m.
Three members were sworn in to the board of education during the reorganization meeting, with Brandy Titus, Jeff Greenberg and Jenine DelPalazzo all being sworn in by Solicitor Dan Long. Afterward, Jocelyn Lewis was nominated and unanimously approved to serve as board president, while Rebecca Holland was unanimously approved to serve as vice president. During public participation, two women addressed the board, both calling for the resignation of Superintendent Kristin Martello. Dali Kilpatrick, president of the Berlin Borough Education Association, spoke at the podium with more than 20 supporters standing alongside her while she made her statement. Kilpatrick, speaking for the association, said many in the association feel the school has become a second home for them after years of teaching in the district, going through plenty of growth and change over the years. Kilpatrick said the BBEA has attempted to work through the chain of command, but does not feel it has received satisfactory results. Jennifer Adair-LaFountaine said she had asked to meet with the board in closed session that night but was denied. She said her child is being denied a public education, and she is being forced to home school her son because the school is allegedly denying medical notes from medical professionals. “Therefore at this time I have no choice, and I demand, due to the continued mishandling of the educational needs of our children at Berlin Borough, the immediate resignation of the superintendent, Kristen Martello,” said Adair-LaFountaine. “Get rid of her, it’s time. It’s time for her to go,” Adair-LaFountaine said. The board went into nonpublic executive session after public participation to speak on a personnel matter for approximately 45 minutes, however no action was taken after returning to public session. According to the district’s 2016–2017 budget, which is published on the state Department of Education website, Martello earns $125,000 per year under her contract, which runs through June, 30. There also was a presentation during the board meeting from the Berlin Borough Police Department, as Sgt. T.J. Varano discussed the future implementation of ALICE active shooter training for staff later this month. ALICE, which stands for Alert, Lockdown, Inform, Counter and Evacuate, is a new way of reacting to an active shooter than the traditional way that has been taught in schools and businesses for years, according to Varano. Varano said the current way Berlin Community School staff and students are taught is “to lock the doors and hide in a corner.” And while that is not unusual to be taught in most schools, Varano said the Department of Homeland Security or the New Jersey Security Task Force does not recommend this type of reaction to an active shooter. Varano said he believes teachers go through a lot of training to react to an active shooter, which is a positive, but evaluating that training should never stop. Varano showed text from a recently released report on the shooting at Marjory Stoneman Douglas High School in Parkland, Fla., as well as video from other incidents at other schools or locations, showing why the traditional way of reacting is not effective. ALICE training focuses on teaching a proactive approach, giving staff and students options in reacting. Later this month, staff at Berlin Community School will undergo training in how to better react and be prepared in the event of an active shooter. The school also plans for parents to be brought in sometime in the future to learn about how students are being protected, as well as have age-appropriate grade levels, such as sixth graders and above, learn how to defend themselves.